It is also for the treatment of superficial pyoderma associated with Staphylococcus intermedius and for the treatment of osteomyelitis, caused by Staphylococcus Aureus. 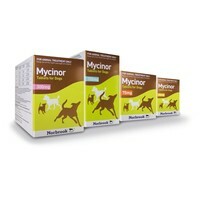 Each Mycinor Tablet contains 150mg Clindamycin (as Clindamycin Hydrochloride). The tablets are circular in shape, white to off-white in colour and can be divided into equal halves for oral administration.